We acknowledge that we dance on sacred ground, honoring the ancestors of this land - the Dakota and Anishinaabe - and extending our gratitude for the ways, past and present, in which they have stewarded this land we call home. May we listen. May we learn. May we be humble. I invite you to make a donation to support the efforts of any Native American Organization doing work in our community to steward the land, re-weave the sacred, and uplift the well being of the culture/stories/communities of the Dakota and Anishinaabe (Ojibwe) people. These sessions are FREE and open to the public through the generosity of St. Paul’s Fitness in the Parks. No registration is required! *Arrive by 6pm to join in our collective centering and 30-min elemental warm up. Free, un-facilitated dance continues thereafter. *We will dance in the small valley just down from the picnic pavilion. Join us at 6pm for a collective centering and 30-minute elemental warm-up or come and go during our un-facilitated dance. *Dance barefoot or with shoes if you need additional support. Bring layers for comfort and protection from the bugs (I would highly suggest natural bug repellant)! *It is a gift and a beautiful exploration to bring our practice to the land, and yet we are moving in a public setting. People may pass nearby to observe, ask questions, or take photographs. Our container becomes more permeable, less defined, and for some, a bit more vulnerable. Please know some or all of these factors may be present. You may be photographed or recorded. If this distracts you from your practice, I invite you to stay present as witness. 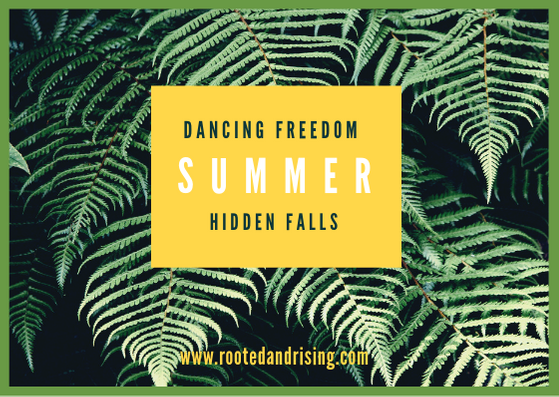 *Finally, these sessions are collectively co-created with facilitation to open and close the space, and ample time for your own personal dance. Please bring items to contribute to the creation of the altar, and consider being a greeter for a session (invite new dancers into the space and/or answer questions from the broader public). Classes will be canceled due to rain!